Quorn Hunt was based at Quorn Hall in the village from 1753 to 1906. The hunt brought huge benefits to the locality, in the form of wealth, employment and also fame. 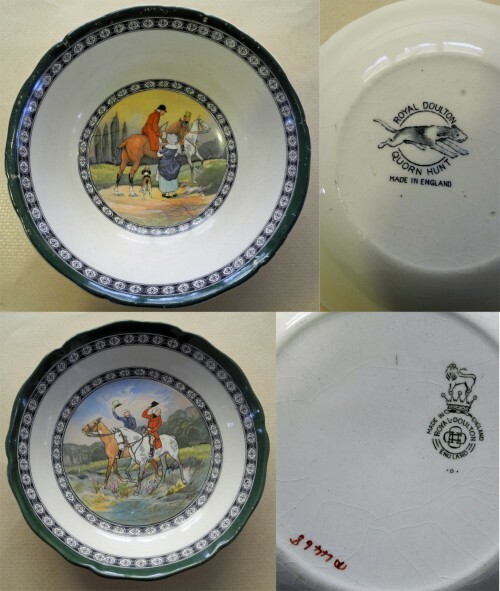 Royal Doulton, the well-known manufacturer of ceramics, saw the popularity of the hunt as an opportunity, and in 1924 they produced the dark green trimmed ‘Quorn Hunt’ range of pottery, which continued for fifteen years. A full set would include cups, saucers, tea plates, teapot, milk jug, sugar bowl, dishes and a sandwich tray. The model number for the Quorn hunt range was D4468. The first dish is 6 ¼ inches (16cm) in diameter, and the second dish is 5 ¼ inches (13.5 cm) in diameter. Many thanks to Sandie Dixon of Southampton, who very kindly donated the dishes to Quorn Village On-line Museum. Submitted by: Sandie Dixon via Jan Evans!